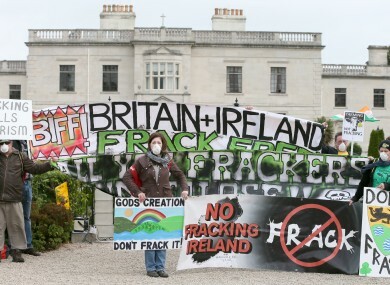 Anti-fracking protesters from Leitrim and Roscommon pictured at the Oil and Gas summit last year. LEITRIM COUNTY COUNCILLORS yesterday voted to ban fracking in the county, despite a warning from the county manager that they could be held financially responsible for future costs incurred as a result. This means a section will now be inserted into the county’s development plan with a commitment to refuse permission to plans which involve the use of the controversial drilling method. The motion passed with 17 votes in favour while Fine Gael councillor Gerry Reynolds voted against it and four of his party colleagues abstained. Speaking to TheJournal.ie today Fine Gael councillor John McTernan, who voted in favour of the motion, said it was “basically a waste of time”. “What we were putting in meant basically nothing – it was more of a protest than anything,” he said. Any applications for planning will still have to go through the same processes so this does not mean that there is actually a ban on fracking in Leitrim, it merely means that councillors’ opposition to it has been registered in the development plan. “There are definitely questions that have to be answered about it,” McTernan commented. There’s a horror in Leitrim of this, and a fear – people are very afraid of it. There was controversy surrounding comments made by the council manager Martin Dolan about councillors who voted in favour of the motion being liablefor costs incurred by the council as a result of this. However a spokesperson for the council told TheJournal.ie that he was merely reading out a section of the Local Government Act, advising them that the vote would be contrary to legal advice- something he is obliged to do as county manager. Despite the lack of power of the motion, anti-fracking activists hailed last night’s vote as “a major victory”. Roughly 100 people assembled outside the council chamber in Carrick-on-Shannon to express their opposition to fracking yesterday as coucillors met to discuss it. “We’re delighted that the council have sided with the people and sent such an emphatic message to the government and to the oil and gas industry,” said Mairead Higgins, a member of Love Leitrim, who attended the gathering. Email “Leitrim county councillors vote to ban fracking”. Feedback on “Leitrim county councillors vote to ban fracking”.